So, let me give you a little background on this project. You see, my parents still have the same furniture they had when I was kid. Sure back in the 80’s those pieces may have been fashionable, but the years have taken a toll on them and it was definitely time to get the parental unit’s decor into the 21st century. So project #1 for mom and pops was to give some of their furnishings a little personality starting with a dull, scratched up night stand and dresser and I’m so excited to share the evolution. The best part is that it was so incredibly easy. My secret to effortlessness: spray paint! That’s right. 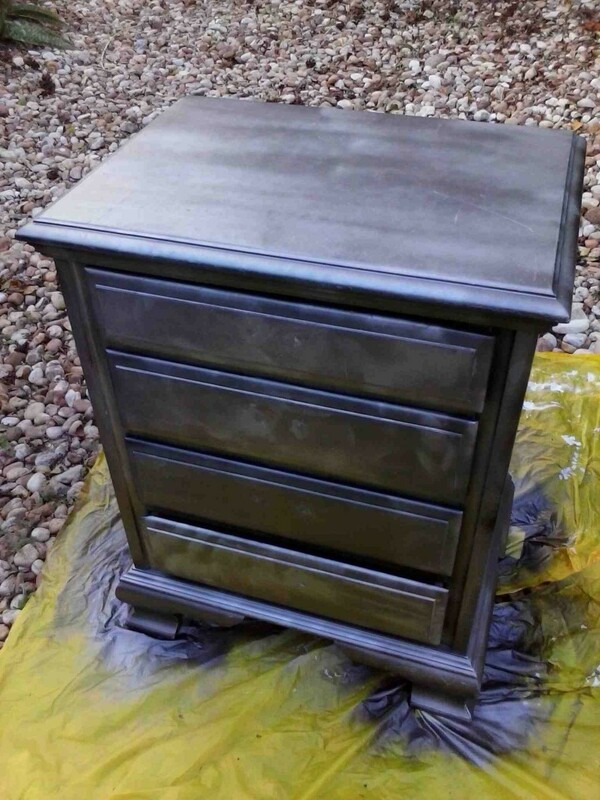 I worked the same process on both pieces, so I’ll only show the step by step on the night stand (because I didn’t take enough pictures of the dresser) and at the end of this post you’ll get the big reveal. Oh wait, I already posted it above. Okay, well you’ll get the before and after pics. How ‘boat that? Step 1: First, make sure you’re working in a well ventilated space. I did my work in my private studio that my parents refer to as their front yard and patio. Once you’ve got a comfortable work space, remove all hardware, fill holes with wood filler and sand down the filled holes till smooth. As you can see I already did that on the dresser. Step 2: Spray paint goes on really thin so any imperfections or scratches on wood will really stand out after painting, so sand anything you don’t want to see. 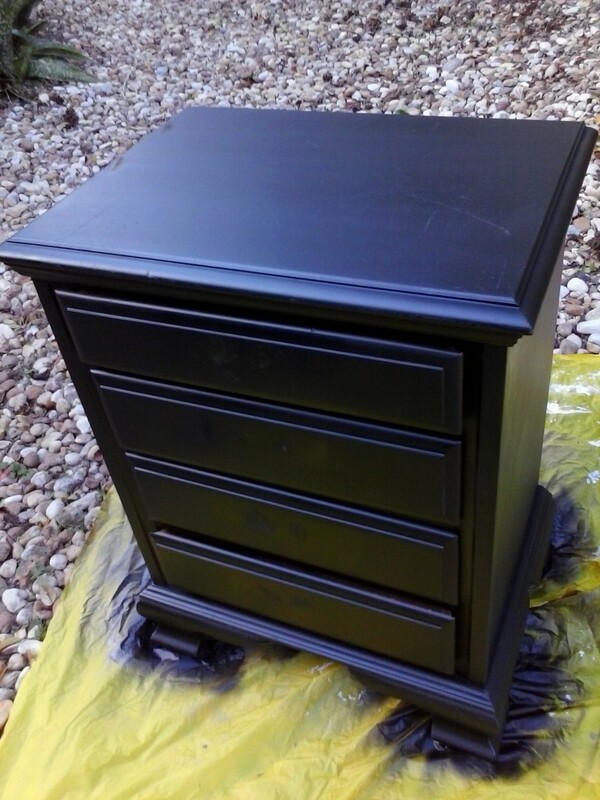 Step 3: Remove drawers and apply a thin layer of chalkboard paint to the drawer faces and the body of the furniture. Now, you’re probably wondering why I used chalkboard paint instead of regular primer. It was sort of an experiment. I read that chalkboard paint sticks to anything so it makes a pretty good primer. But the real selling point for me is that there’s no need to sand the surface. Confession: I HATE SANDING. I’ll admit, I did sand a few scratches on the top surfaces, along with the wood filler surface. But I have no problem taking a shortcut if it means I get to skip the sanding. And whoever said chalk board paint makes a good primer hit it right on the nose. I’m sold. Oh, and here’s my spray painting lesson learned: It’s really easy to get pooling and drips on your surface. To avoid this make sure to hold the can at least a foot away from the surface and keep the can moving in sweeping motions so the coats go on thin without drips. I did two coats of the chalkboard paint before trying not to screw up the real finish. 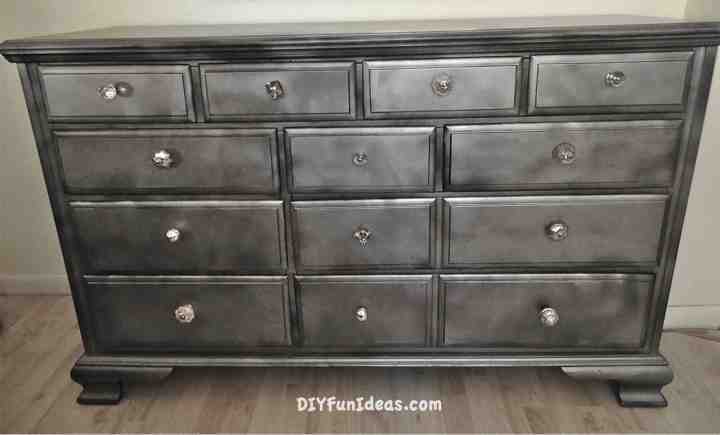 Primed drawers with chalkboard paint. Two coats. 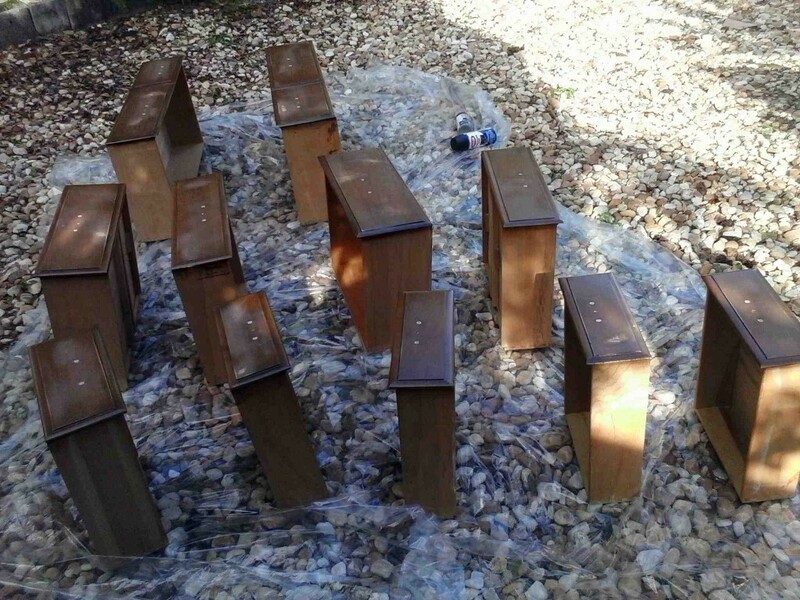 Night stand primed. Two coats of chalkboard spray paint. Well, it didn’t quite work out that way. But still, I really like the finish I got. It’s sort of a gun metal looking finish. While spraying, I went heavier in some areas and lighter in others giving the finish an uneven look where some of the black comes through on some areas, while other parts are very silvery. The heavier painted areas are accomplished with more layers rather than thicker paint because as I mentioned in step 3, the paint will pool and drip if you don’t keep the layers thin. The cans are only 6 ounces, so I used a total of three cans for the two pieces of furniture. Step 5: Sealing your surfaces. 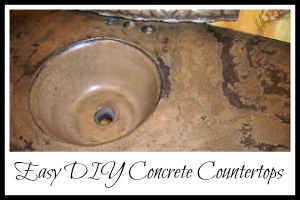 You’ll want to seal your painted surfaces to protect from chipping, water damage, etc. I used Valspar Protective Finish. It’s water based and goes on milky, but dries clear. I used two coats of the finisher. To avoid brush marks: 1) as I mentioned earlier, definitely use a good quality brush, and 2) Lightly sand between coats. Yes, I hate sanding, but this wasn’t too bad since it was such a quick light job. The theory here is that there are peaks and valleys of the substrate left on the surface after painting with a brush. Sanding gets rid of the peaks and the next layer fills in the valleys so you end up with a smooth surface. Sounds reasonable, huh? 3) Keep the layers thin. 4) And finally, after you’ve started to put down a layer, DO NOT run your brush back over. Once the paint/finisher starts to dry if you run your brush back over it you’ll end up with some clumpy sticky looking stuff. So just a quick coat and let it dry. 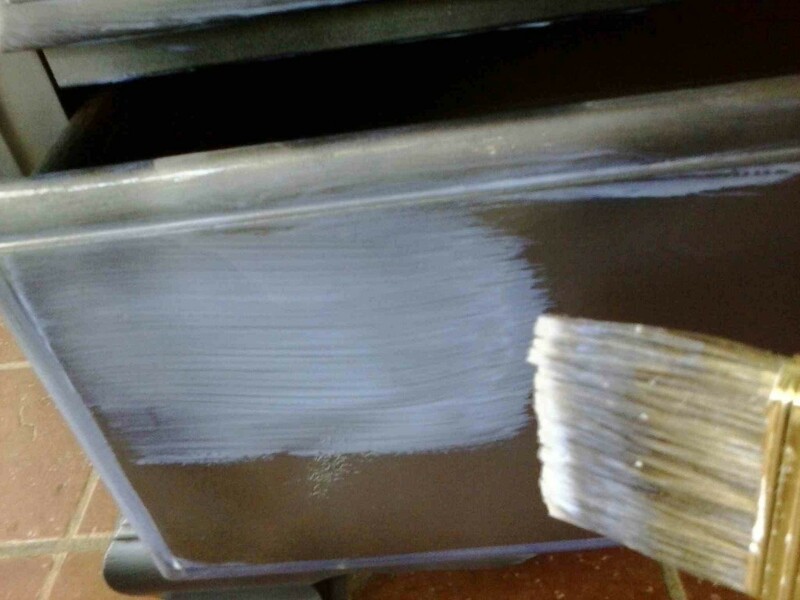 If you’re worried about brush lines, just wait to sand instead of trying to smooth with your brush. And one last thing on the sealer… While I liked the smoothness and the final finish of the Valspar product, it really bugged me that even after letting the dressers sit outside for a few days after the final coat, I could still smell the product almost two weeks after bringing the pieces back into the house. The plus side though for Valspar is that it’s only $7, more than half the price of their Minwax Polycrylic competitor. But Minwax does claim to have “little odor” so I’m thinking that next time this sensitive schnoz will dish out the $17 for a quart of it. Step 6: Hardware! This is the super fun part. Shopping! 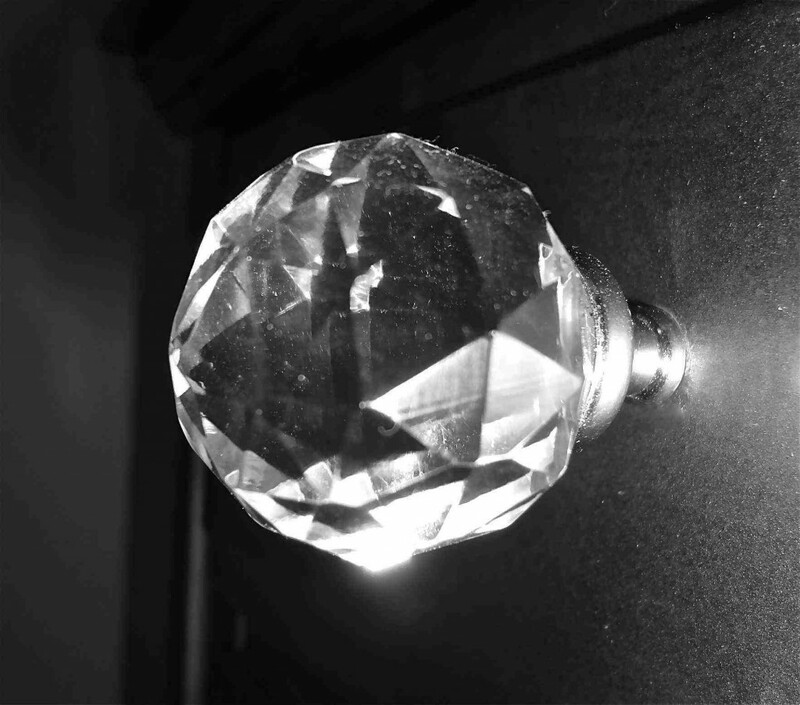 I found the most awesome glass knobs at Hobby Lobby. And what gets even better is that about once or twice a month their knobs go on sale for 50% off. Score! And you know what that means… I’m actually saving money by going shopping! 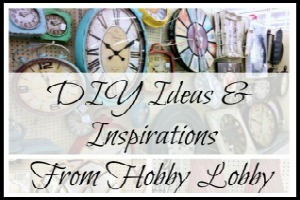 I needed 17 knobs and the regular prices at Hobby Lobby range from $3 to $5 per knob. But with the 50% discount I got all 17 knobs for about $40. Score. Score. I mismatched the knobs for more of a shabby chic kind of look. 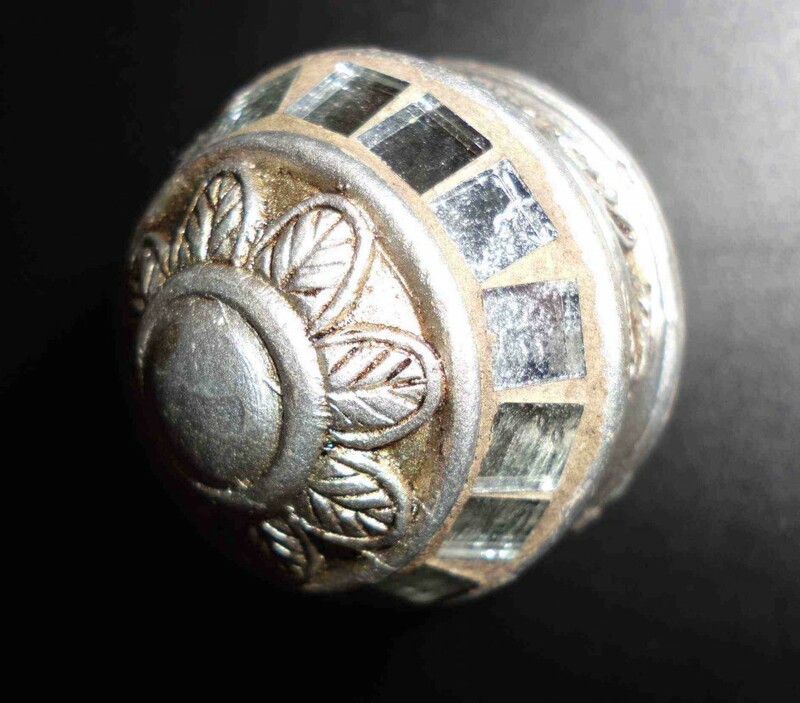 Check out some of the perdy knobs, all installed and gorgeous looking. What can I say, I like shiny things. And now, the big reveal. 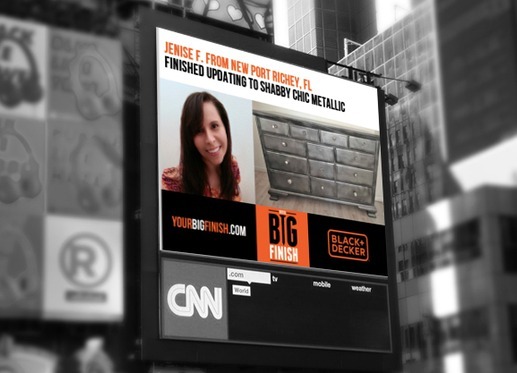 Okay the second big reveal…. 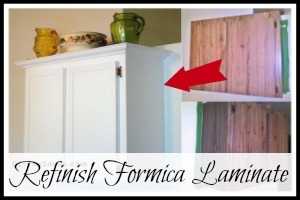 Also check out my DIY fantabulous formica cabinet makeover where I put together my own unique chalk paint recipe. Links to blog parties here & here. What a transformation! Love the way look of looking glass. Thanks for coming by and linking up with us at Your Designs This Time. We can’t wait to see what you sharing with us next Monday! I love that someone actually finally braved this. 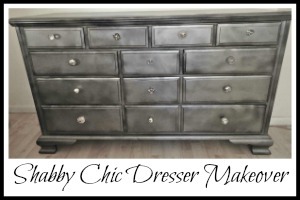 Your dressers look fantastic and totally chic! 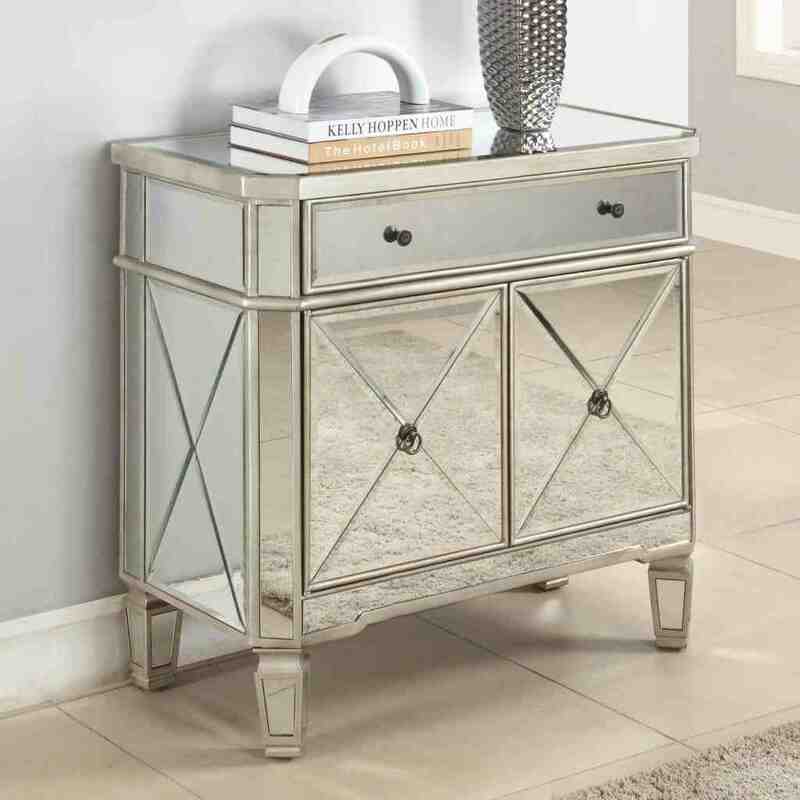 I love the mirrored style right now and debated on how to transform my dresser into this as well, but I went with contact paper instead. (http://www.stripesandpolkadotsblog.com/2014/04/contact-paper-furniture-update.html) Maybe next time I’ll try this method! Awesome job! Thanks so much, Sara! Actually, I think the contact paper looks awesome! What a great idea. Fun! You did a great job! I like the new look. I have similar furniture that is need of some TLC! Jenise, I’ve got to say I was surprised when I saw you used Krylon Looking Glass Spray Paint but I’m really liking the results! 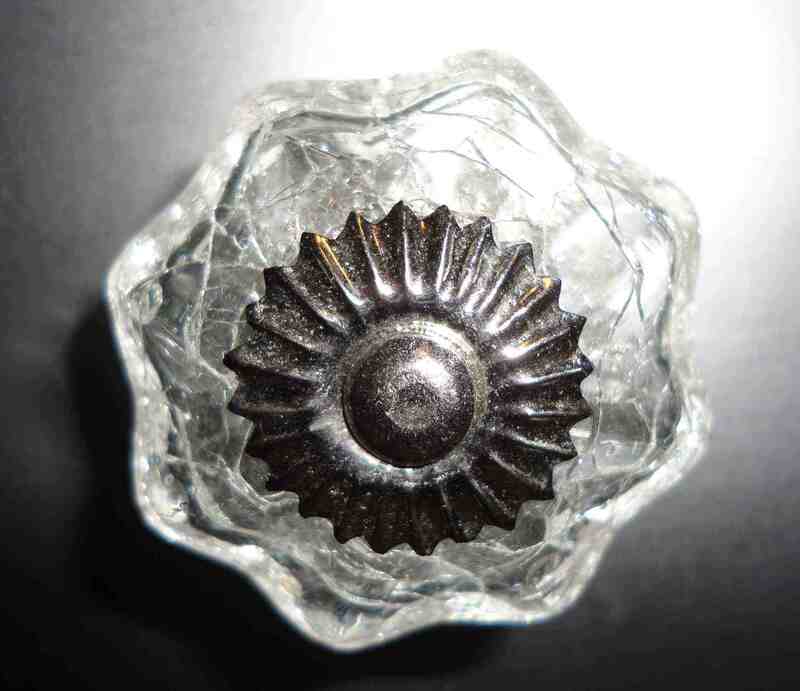 Lov’n the assortment of glass knobs too. 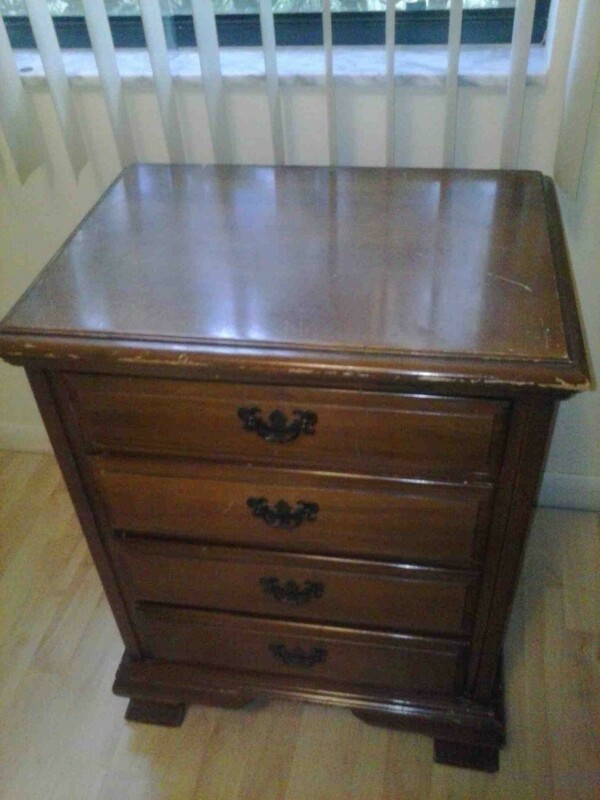 Nice job and so glad your night stand caught my eye at the Link It Or Lump It Party. 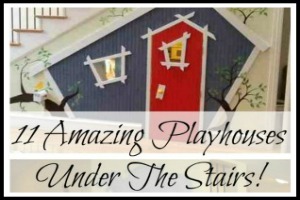 This turned out just fabulous – thanks so much for sharing !!! Hopped over from Glitter GLue and Paint – and I’m pinning ! Thanks so much for stopping by Suzan. I just checked out your page. Lots of AMAZING before & afters! Are there tutorials for them? Would love to feature one, but I can’t seem to find the tutorials. Thank you very much Mimi! Try Amazon.com. They have everything. Wow! I learned something new — chalkboard paint as a primer? Mind blown. 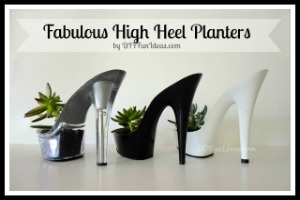 This is absolutely the perfect tutorial I needed to see, as I am getting ready to re-invent two side tables for my Master bedroom. I already have a mirrored Armoire in the room, so a finish like this will match splendidly. Thanks Jenise! Thank you so much Nanette. I’m so glad you like it! If you have any questions along the way while you’re refinishing those side tables, I’d be more than happy to try and help! Loving this!! You did a fantastic job and I love that gun metal look! Thanks so much for linking up with us. Thank you, Kristi! And thank you so much for hosting!! I Love it!! Sometimes through experimenting you come out with something wonderful…And this is one of those instances. I really, really love the mix of knobs you used. It just adds to the lovely metalic finish. Both pieces look wonderful. What a great makeover. I especially love all of the knobs. Thanks for sharing with SYC. Jenise, I just love this. You did a fantastic makeover on the furniture. 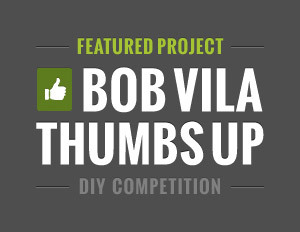 Thanks for sharing at Project Pin-It Thursday. I will be featuring you this week. Woweee!!! Thanks Denyse! This will be my first feature. I’m totally thrilled. I’ll be sure to tell all my readers to head on over! Great look – very modernistic. Thank you Todd. I’m very happy with it! Looks great! 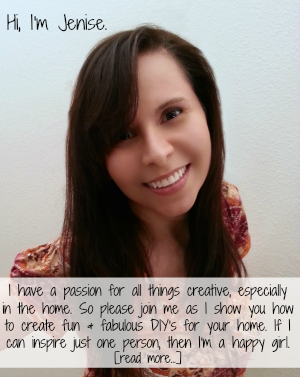 I would love it if you joined and contribute your awesome posts at my link party at City of Creative Dreams on Fridays :D Hope to see you there at City of Creative Dreams Link Party. What a great idea, it looks good! Thanks for linking up to Sweet and Savoury Sunday, stop by and link up again. Have a great day!! GREAT JOB with this! A lighter look would work better with my room décor. 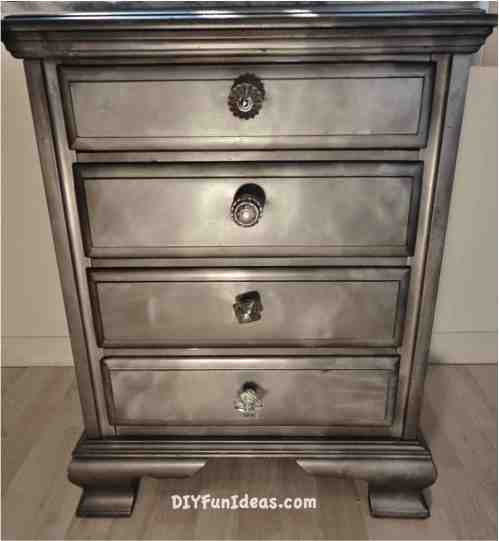 Do you think I could achieve this by using a lighter primer/chalk paint… perhaps in a gray tone? 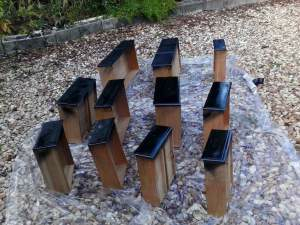 Hi Tonnie, I’m not 100% sure, but I think if you go light with the spray paint and let the primer show through then you would definitely have lighter areas, whereas I let the black primer show through which gave me the darker areas. I would definitely recommend testing that out on a practice item. And please let me know how it turns out!!! What an inspiring piece of art! I am totally impressed with that furniture revamped. You did an excellent right there, really inspiring. 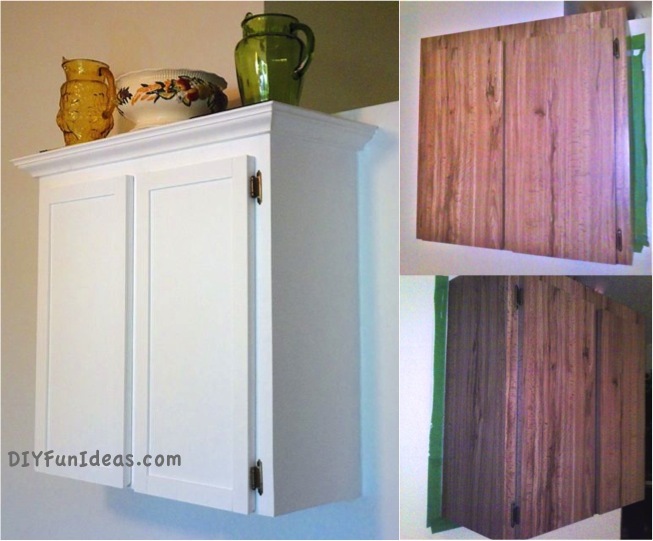 The chalk paint spray is not a bad idea at all, I think it works very well and will definitely save you time. I will surely share this one. Dear Janise, thank you for inspiring me. I am about to try the same at home. It is a great shabby chic alternative for men ( who do not really like the classic light version). I have a question: how long did you wait between the few thin spray coats of the chalk and mirror spray? Hi Nicole! You just put a great big smile on my face! I’m so glad I’ve inspired you! Anyway, for all the coats of paint, even chalkboard to mirror pain, I waited somewhere between 1-2 hours. And I definitely had all the coats done within one day. Remember, though, that there is a difference between paint dry time and paint cure time. Paint cure time is the amount of time it takes for the paint to reach it’s maximum hardness and that can take a few weeks. So even after you’ve completed your fabulous shabby chic project, try not to handle it too much or put items on top of it for some time. That way you’ll avoid messing up the finish of your gorgeous new dresser. And please let me know if you have any more questions. Glad to help anytime! And happy holidays in Germany! Instead of using the chalk spray paint could I just paint with a paint with primer? Or use chalk paint that I make myself for distressed projects? I’m not a spray painter AT ALL!! I’d rather paint by hand. Yes, Christy. You can absolutely use either. For me the chalkboard spray paint was just an experiment. But the Looking Glass Paint only comes in spray so there’s no other choice for that one. Just remember light coats and keep the spray can moving. And let me know how it turns out! 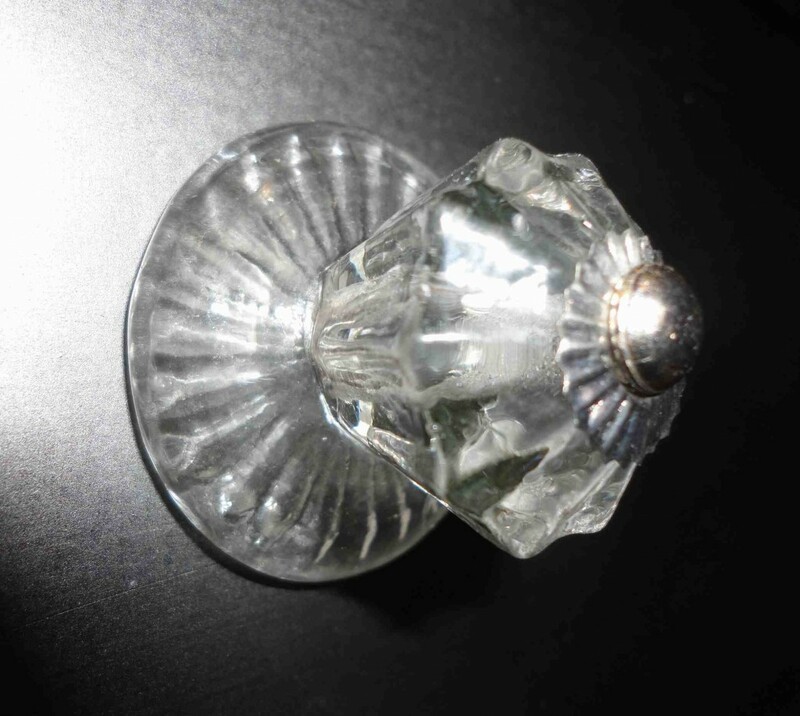 I might be mistaken, but I think “Looking Glass” paint is meant to be sprayed on the underside/inside of a glass object and seen to from the opposite side, but I’m glad you’re pleased with the results. Was black your base color and then you used the glass paint gave it the grey tones. I have an identical dresser and i would love to make it look like yours. Have you used other base colors with the glass paint on top. My son’s room is blue and I was going to use a blue base. Hi Janelle, Yes, black was the base color and then applied the glass paint over it. I have not used any other base colors, but I think a blue base would look really cool! I really loved the pieces. I liked yours better than the mirrored look you were going for. I believe Martha Stewart has a video on how to make mirrors from scratch. Maybe that can be done on your future projects. 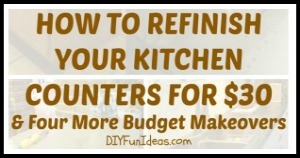 I did my kitchen cabinets in Fleck it once and changed the knobs. I took the doors off the cabinets, sprayed the frames and it the he urged out great. Hooray for spray paint. Thanks so much Larita! I’ll have to look for the Martha Stewart video. Yes, I definitely love spray paint. So glad you’re cabinets came out awesome! Beautiful dressers!! I’m getting ready to work on something similar. 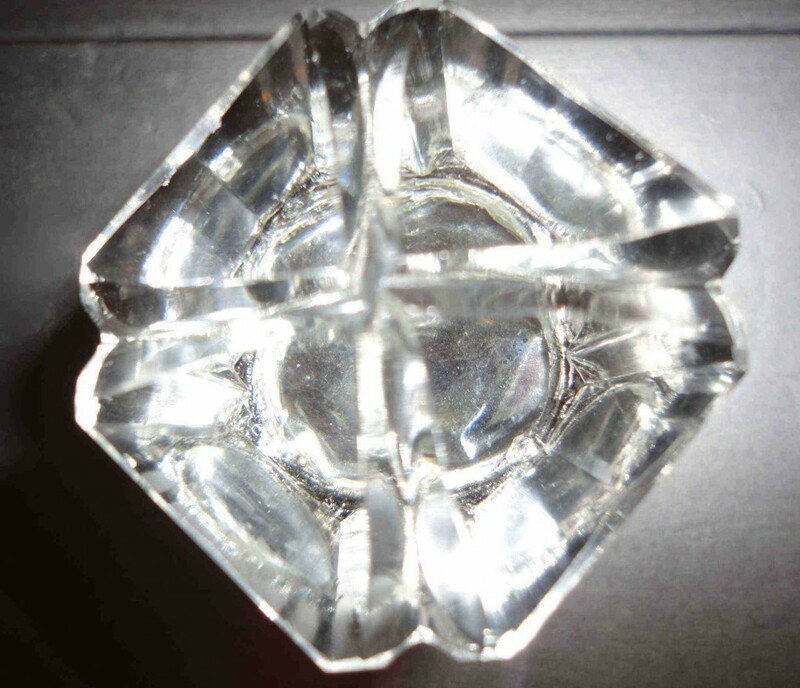 I am removing hardware with two point and putting in a single hole pull knob…Do you see the old hardware holes after the whole process is finished? Thanks so much Jennifer! That’s so nice of you to say. I do not see the hardware holes on my dresser, but I did fill it, then sand it, then fill and sand one more time just to make sure it was perfectly smooth. If you do see the holes, just fill and sand again. Hope that helps! Yay! That’s awesome Kate. 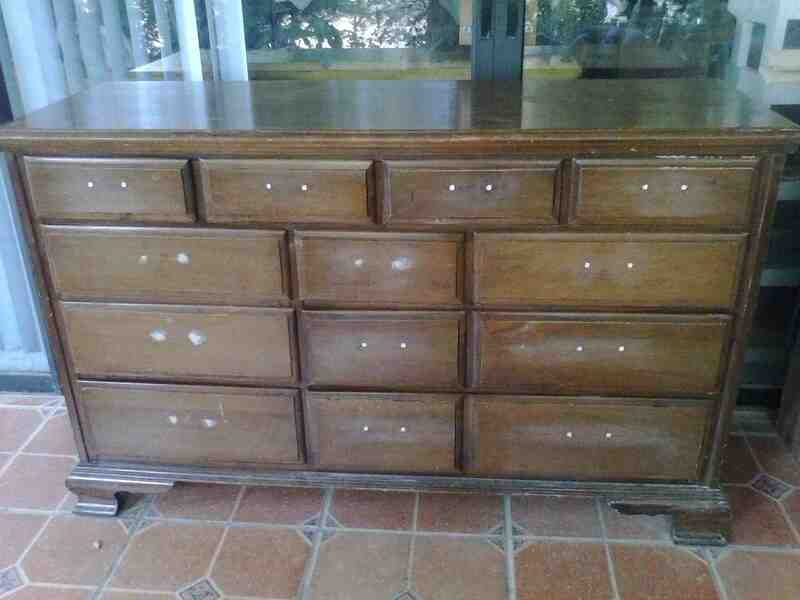 Please let me know how your dresser turns out! Thanks for the suggestion. I’ll have to look into that! Hello LOVE LOVE LOVE this design it is absolutely BEAUTIFUL!!! My question is does the Krylon Chalkboard and Looking Glass Mirror-Like products come in a paint can form? I have insets on cabinet doors to do and paint would be more manageable. Hi SimplyT. Looking Glass paint only comes in a spray can, but chalkboard paint does come in cans. Hope that helps! 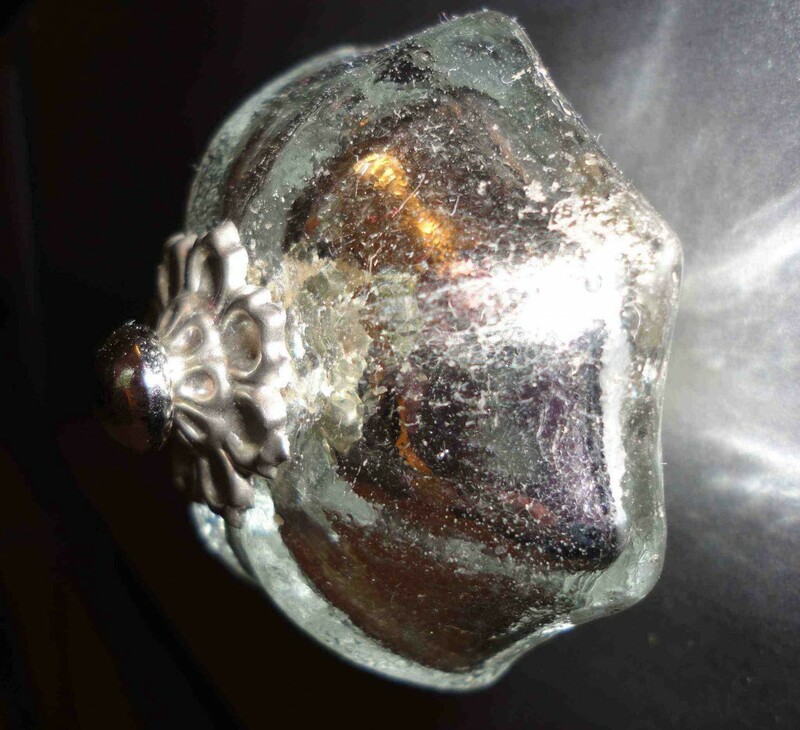 Hi have a question, on the nightstand, is that looking glass spray paint in silver or gold? because it looks kinda bronze in color? Hi Patti, The paint only comes in silver. The nightstand is actually the same as the dresser, only I took the nightstand picture at night so it’s got the glare of the incandescent lighting. as brush on, in cans, instead of spray can?? I just read all the comments and found my answers!. THANK YOU! So glad you’re loving the Looking Glass paint on wood look and that you found your answers, Bonnie. Have you finished your book shelf yet? I’d love to see pictures!!!! Feel free to forward to me ([email protected])! Thank ypu for the great instructions. I am in the middle of this project and it is turning out beautifully. How can I show you a photo? Apologies for the delayed response. You can email me at [email protected]. 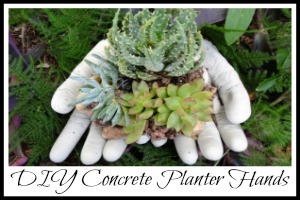 I’d love to share your creation on my facebook page!